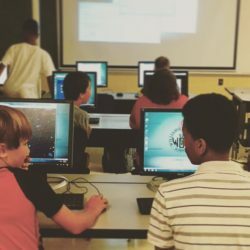 The NTC Technology Summer Camps allow students to learn the basics of programming. Our curriculum immerses kids in an engaging, real-world environment in which they are challenged to create with code. By giving students the resources needed for success, we hope they will become leaders of the high-tech workforce. Throughout the week, they will meet professionals from the technology industry who can speak with students about education, computer science, technology & more. At the end of the week, we will host a “Demo Day” for parents and friends. What kinds of camps do you offer? Six different technology camps are available this summer for ages 8-18! Summer of 2019, of course! Each of the camps lasts five days unless specified. They are scheduled between June and July and will meet from 9:00am to 3:00pm. We do not offer an extended-care option. Camps are available in Davidson Counties. Check out each of the individual camps to find one near you! Students will need to bring a packed lunch each day. All students will need to have an email address to use in order to save their work throughout the week. All other equipment and supplies will be provided unless specified in the camp description. Who are the code camp Instructors? All of our Instructors are either school teachers or experienced professionals. They are extremely knowledgeable in their subject areas, and have prior experience with kids & classroom management. Each week of camp has an individual registration page. After choosing your preferred camp, please register with parent/guardian information as well as the student’s information. It is important we have both email addresses for communication purposes. You can submit a scholarship inquiry form at the bottom of this page. Please submit your request prior to registering. One inquiry per camp. During this summer camp, campers will learn the basic physical properties of rocketry. Campers will design and launch virtual rockets through Whitebox learning. When the children have perfected their virtual rockets, they will print designs and construct a bottle rocket to launch on the final day of camp. Campers will learn the history of rockets; create paper and straw rockets all while preparing for the final launch. Sphero is a ball shaped robot which follows the directions of a “blockly program” similar to Scratch. Blockly helps make this camp accessible to people who have never programmed. This one week camp will teach you how to think linearly to help Sphero conquer a series of challenges, such as mazes, bowling, racing, battling, geometry, painting & more. Learn to program with Dash Robots! Dash responds to voice, navigating objects, dancing, singing, and more. Students will learn the basics of coding while designing behaviors & interactions with Dash. These robots provide a fun way of learning essential skills of collaboration, communication and digital literacy. A great introduction to computer programming. Students will generate more than a dozen different programs in this drag and drop educational language. Students will also learn how to create their own blocks, debug faulty code and push their projects up to a shared space. A strong primer for someone who is new to coding or just needs a refresher course. This camp will provide an introduction to programming, hardware & software, as well as problem-solving strategies. Students will work in teams to design, build & test different types of robots and have the opportunity to compete against other groups! Students will use computers, batteries, cables, LED’s, DC motors, gears & more. 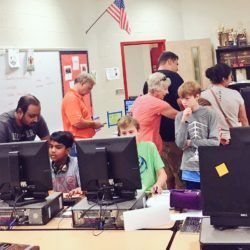 Topics covered include motor assembly, gear ratios, torque, friction, sensors, timing, programming, logistics, critical thinking and binary numbers. Technology and music come together in this session centered around a digital instrument called the Artiphon Instrument 1 (artiphon.com). Through exploration of this versatile music-making tool, students will learn or refresh basic music and composition skills and use computer-based music editors to complete music-based challenges and create individual masterpieces of their own favorite genre. 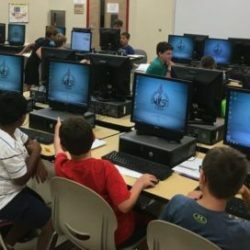 In this introduction to basic computer science concepts, campers will use the 4 step problem-solving process with a variety of activities, ending with proposing and designing an app to solve a real world problem. With step-by-step instructions, and through the identification of the problems they encounter in everyday life, campers will be empowered to create and share their proposed apps. Sphero is a ball-shaped robot which follows the directions of a “blockly program” similar to Scratch. Blockly helps make this camp accessible to people who have never programmed. 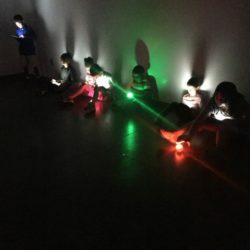 This one week camp will teach you how to think linearly to help Sphero conquer a series of challenges, such as mazes, bowling, racing, battling, geometry, painting & more. Thank you for your interest in scholarships. If you have any questions, please send an email to Jacqui Logan.